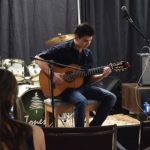 I am a current University of Toronto student enrolled in Bachelor of Music Education with classical guitar as my major. Experienced teacher that will teach you how to play guitar with good technique, the ability to read sheet music, and music theory. Music is something that all kids should participate in, and should have fun doing it! That is something I guarantee to deliver.